Semalt - Hundreds of Thousands Succesful Stories! A Semalt crawler is a technical bot of the webmaster tool Semalt.com. 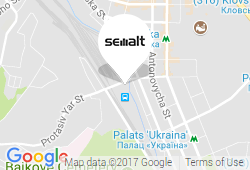 According to the software algorithm, Semalt crawler bots visit websites and gather statistical data for our service simulating real user behavior: unique IP, browser, display resolution, etc. This information is used exclusively within the Semalt.com project and isn’t revealed to a third party. Our crawler bots have 100% bounce rate and don’t click on advertising banners (cpc, cpa, cpm systems) or extend links. So, there is no need to look for some hidden motive or conspiracy if your website is visited by our crawler. All the visits are automatic and random. How to stop the Semalt Crawler? If you want to eliminate your website from the list of web resources we visit or to prevent it from future visits, please, add it in the field below. Your website will be eliminated from our base in 30 minutes after you fill in the form. Your website(-s) is being processed and will be removed from our base. Thank you for understanding and cooperation. Your website is not in Google TOP? The solution is right here. Let us help you and your business.